LEGIT TOOLS FOR LEGIT LITTLE HELPERS - Whether you're fixing something around the house or working on a cool building project in the backyard, your girls want to help. As parents ourselves, we know how frustrating and unsafe it is for little helpers to use tools crafted for adult use. My First Tool Set - PINK is specially designed to fit comfortably and safely in little hands, so they can help too! 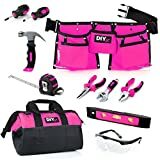 11 PIECE STEEL FORGED PINK TOOL SET FOR KIDS - My First Tool Set - PINK by DIY Jr. includes a: Professional Grade Child's Hammer, 6" Combination Pliers, 6" Crescent Wrench, 10' Tape Measure, 6" Needle Nose Pliers, 1.5" Phillips Head Screwdriver, 1.5" Flat Head Screwdriver, 9" Professional Level, Child-Sized Safety Glasses, Handy Child-Sized Tool Bag, and a Riveted Child-Sized, Adjustable Tool Belt. REAL TOOLS FOR GIRLS - If you've been looking for a real toolset for kids to learn, build, and create with, then this pink version of My First Tool Set is exactly what your family needs! This fun kids' tool bag is filled with real, steel-forged tools specifically sized and fit for children. They'll love sporting their very own, fully functional pink toolbelts and filling it up with their child-sized, real tools. BUILD THE LEGACY - Working side by side with your child is a priceless way to teach them essential skills as well as proper tool safety, use, and care. Our unique tool sets were developed with professional grade materials, so they're built to last for generations. Someday, what you teach your daughter or granddaughter will be passed on to her kids right along with this sturdy set. The future starts at home.